We are a non-profit organization that relies fully on private, public and corporate donations in order to make these trips happen for our WWII, Korea and Vietnam War Veterans. We proudly honor the Veterans that served in peacetime between these wars, as well. Thanks to everyone who have helped us make 2018 a great success! We are looking forward to a great 2019 flight season. The 2019 flights have been scheduled! NOTE: The 4/16/19 flight arrival time is approximately 8:45pm. Flights depart at 6:30am and return around 8:45pm at The Eastern Iowa Airport in Cedar Rapids, IA. We invite the public to come out and welcome home our veterans after their trip of Honor. You will be able to see on their faces just how much your donations and support means to them. As a reminder, parking will be free to all who turn out for the welcome home. Thank you to all Veterans, Guardians and Volunteers who helped us out in various ways since our inception. We truly appreciate everyone’s time, effort and support in our cause. Thank you for giving that 110 percent in everything you do. A very special thank you to our countless donors – without you, this dream would not be possible. On Monday, December 8, 1941, President Franklin Delano Roosevelt appeared before Congress giving what is now referred to as the Infamy Speech. Shortly thereafter, Congress declared war against Japan. More than 226,000 Iowans answered that call serving as sailors, soldiers, Marines and airmen in the largest war the world had ever seen. Sadly, there are fewer and fewer of these men and women alive today and few have had the opportunity to see the National WWII Memorial dedicated to them on April 29, 2004 (59 years after the war’s end). With the passing of greater numbers of the WWII Veterans, the Eastern Iowa Honor Flight has now opened up our flights to include Korean War and Vietnam Era Veterans. 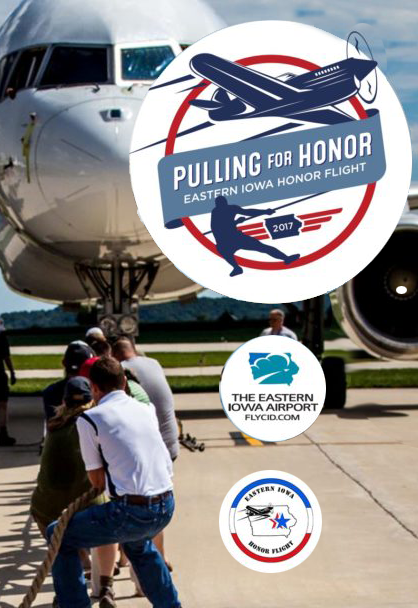 Eastern Iowa Honor Flight is dedicated to making that happen and you can help us give these heroes the appreciation they so gratefully deserve.